I’m leaving this home for two years and it is truly bittersweet. I could write a post about all that I’ve learned, but probably it wouldn’t fit. Thank you all for following this journey, a large part of it is here — in the photos, in the posts, in the random book excerpts and videos. At some point I will move all of this to a personal website, but for now it sits here as a snapshot of the two years I spent after college stumbling my way through everything. Next stop: Washington DC. Goodbye, Jordan. You’ve been sweet and difficult and kind and spectacular, and I can’t wait to be back. I got a new camera that takes great photos of even mundane things. 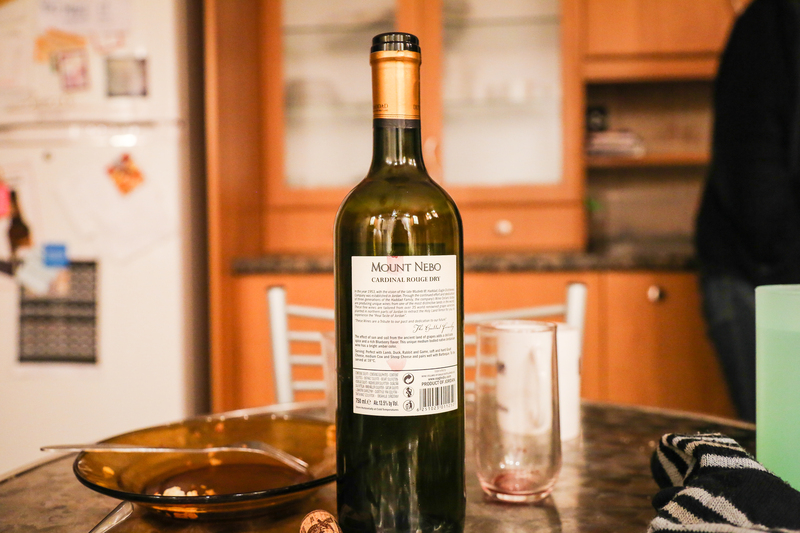 Like this empty wine bottle. I’ll just keep going with the wine theme, yeah? The holidays mean drinking spiced wine with your spicy friends (that is Farah with the Hair). I can’t eat in public. It’s Ramadan in Jordan. Ramadan, the ninth month of the Islamic calendar, the month of fasting. From sunrise to sunset, Muslims abstain from eating and drinking – then everyone gets to have iftar at around 7:45 p.m. where they eat and are merry until about 4 a.m. the next morning. Then, it begins again. Here are ten things I’ve noticed that happen when you are observing (or maybe not observing) Ramadan in a Muslim country. 1. The work day gets shortened. No lunch break. Leave at 2:30 pm. Sleep. 2. Every single restaurant is closed during the day. 3. Insane traffic at 3 p.m., but absolutely no one on the streets at 7 p.m.
5. Weird hours. It’s impossible to know when any grocery store or flower shop or internet cafe will be open. Your best bet is to go at midnight. 6. This is literally the only time Amman has a nightlife, and by that I mean there are actually people out and about after midnight. Wild and crazy means getting falafel at 3 a.m. with everyone else in town. 7. Don’t eat in public. Or drink. I said that already. 9. Dinner is automatically called iftar, even if you aren’t fasting. 10. Most importantly, an excuse every night to have all your friends over to eat and stay super late laughing and stuffing your faces. It’s what everyone is doing. Appreciative chuckles and agreeing nods scattered across the room of 40 students—most have high career hopes, and nearly all have the desire to leave Jordan. It is all coming to a head within their short life spans: the refugee crisis, the high cost of living, the low rates of employment, and the domino effect of the region’s instability. Refugees are pouring across the border in astounding numbers, and the resources will not hold up. The Jordanian government removed fuel subsidies in late 2012, and the anger of the people skyrocketed along with the gas prices. But nothing changed. There is a growing sense of discontent among youth that is palpable. 20-somethings parrot the same refrain to slightly different tunes – there is no work here, we must go somewhere else. In a country where over half of the population is under the age of 25, the implications of this economic fatalism on the future of Jordan are very real. But it is not without precedent: the official unemployment rate in Jordan stands at nearly 13%, and the youth unemployment rate is over twice that amount. If I were in my students’ shoes, I would feel the same way. Yet, this malaise among Ammani youth is simply a microcosm of an epidemic that reaches across the Middle East. 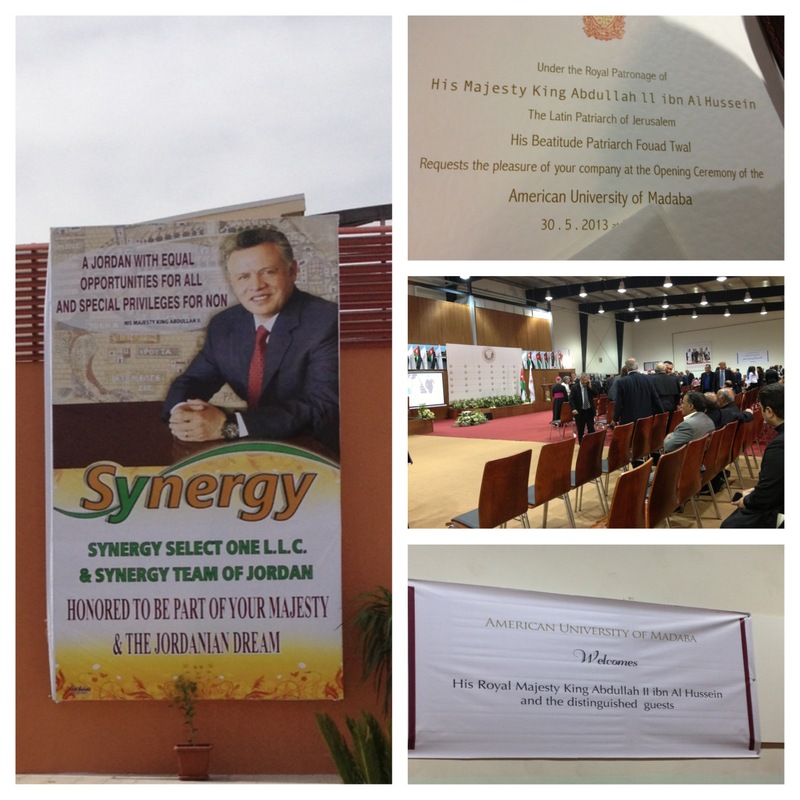 Two months ago, the World Economic Forum for the Middle East and North Africa was held in Amman. John Kerry, Joseph Stiglitz and some of the world’s best and brightest minds camped out at the Dead Sea to discuss the fate of our resilient region. They contended that the youth unemployment problem in the Middle East and North Africa is the worst in the world. News outlets latched on to and widely disseminated the fact that the only way counter this is to create 100 million new jobs by 2020. 100 million new jobs as precarious political situations and sectarian hatred ripple across increasingly porous borders. My students are disillusioned: they have heard all of this before. Talking heads and ineffectual parliaments lament the unemployment numbers, but the reality is that economic and job stability for youth in the Middle East and North Africa has never been quite within reach. What is remarkable and terrifying about the present is that Middle Eastern countries face their largest youth population in modern history. Young people between the ages of 15 and 29 years old make up 30% of the Arab world. There is an unprecedented “youth bulge” that will somehow bear the weight of the region’s economic future when they are currently being given no agency. TIME recently portrayed American millenials as the “me, me, me” generation—Arab millenials could possibly be characterized in the same way, except their cries are being ignored. Who is listening? Where are their testimonies? It is absolutely necessary to invest in Arab youth and to include their voices among those that we hear when discussing the future of the Middle East and North Africa. They must not be excluded and neglected because of antiquated job protection rules and the notion of wasta—that the only way to climb up is to know someone at the top. Education reform and social enterprise are at the heart of this, but also vital is an attitudinal shift in the way the world sees young people in the Middle East. The young Arab man or woman is not a faceless riot instigator or an anonymous victim of a broken system, but rather a valuable member of society and (hopefully) the work force. The huge number of young people means that the unemployment situation is precarious, but also that there is astounding potential within this stratum of the Arab world. If indeed there was some kind of generational shift and Arab youth found themselves positioned to enter the labor force in dynamic and meaningful ways, the future of the region would right itself. At present, the unease among youth is fairly rampant—but who is to say that hope and ambition cannot be just as contagious? I envision this for my students: the first step is that they are heard, the second step is that they feel empowered, and the final step is that they internalize the notion that they can be active agents in Jordan’s economy. We’ve been graced by amazing visitors here in Amman! These wonderful guests have shaken up the routine of daily life here, and forced many of us to venture outside of our comfortable bubbles and re-explore Jordan. On the list: the Dead Sea, Petra, Wadi Rum and Aqaba. One of my oldest friends, Nadeem (I know you’ve seen his artful cameos in recent photos, and yeah I know we have pretty much the same name), was here on a visit from Beirut. We went on a whirlwind tour of the good ol’ Kingdom, and made some interesting friends along the way. Now, this med-school-bound brother of mine is back in Beirut, but I have a feeling there will be more reunions to come. Speaking of important visitors, the king came to my university! It was an event. On Thursday, May 30, 2013, we clamped our invitations tightly to our chests and filed into a fiercely decorated gymnasium in the late afternoon. After two hours of sitting, the roar of the king’s helicopter could be heard and dust blew in through the vents along the walls. The choir began to sing nationalistic songs as the king and his entourage filed in to the sound of deafening applause. I saw the back of his head. He gave no speech, but rather sat in the front row as speaker after speaker took the stage and soliloquized at him. One of my favorite utterances: “Your majesty, you breathe with love.” Amen. I made a collage of the event, for your viewing pleasure and for my permanent memory. May has been rowdy, y’all. I took a more or less impromptu flight to London to meet my beautiful best friend for five days of fun in the United Kingdom. I started a new internship at IOM-Iraq. We had our Fulbright farewell dinner (!). AND I visited Petra for the first time during this particular stint in Jordan. Pictures to come, incha’allah. This is a short post, because we can now tack on blogging to the list of things I’m terrible at. Sorry to my five regular readers. To everyone else, you have a lot to scroll through from my overzealous days (ah, youth) so I don’t even feel bad. I’m impressed by all my friends, most all of the time. They are smart, informed and they care about things that impact the world. Once in a while, though, one of them does something so spectacular and innovative that it even catches me off guard. 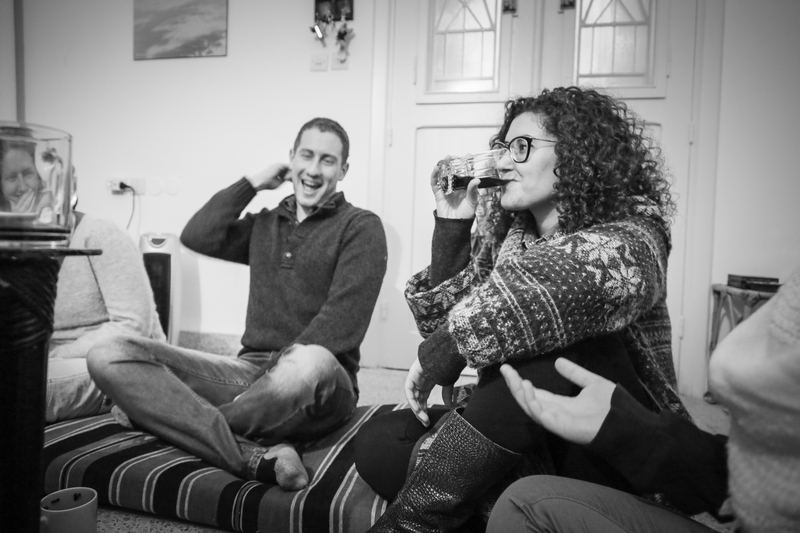 With the help of some fellow Fulbrighters (Maya, Biff, Mike, and Vicki), my friend Ryan–as a part of his Fulbright research–has launched a blog called bayan, which translates opinion articles from Jordanian newspapers into English.